Yes, according to a small but growing number of advisors using ETF managed portfolios. Asset allocation is widely considered the leading factor for portfolio design and management. A number of studies find that 90% or more of an investment strategy’s performance volatility is directly related to selecting asset classes and choosing weight— even if the game plan targets individual stocks and bonds. Why, then, are a rising number of financial advisors farming out this critical aspect of money management to fund companies and boutique shops? Shouldn’t the primary driver of investment results be kept in-house? Not necessarily, according to a rising tide of advisors. The reasoning boils down toenhancing efficiency by giving you more time to focus on areas of the business where the potential for value-added service is higher. Managing money directly, by contrast, is better left to investment firms that specialize in the niche, or so the converts to outsourcing believe. Outsourcing isn’t new. The use of mutual funds, which have been around for more than a century, is one way that advisors have been transferring day-to-day investment oversight to outsiders. The popularity of ETFs has extended and expanded the trend. The rising use of complete portfolio solutions using ETFs represents the next phase of transferring key portfolio decisions. It’s one thing to use mutual funds and exchange-traded products instead of picking individual securities. But more advisors are opting to also give ETF specialists the ability to select funds, structure the asset allocation, and choose rebalancing dates. The trend represents the last step in moving the investment management to fund companies and other firms that specialize in managing ETF-based portfolios for advisors. At the end of 2017’s second quarter, Morningstar was tracking more than 1,000 managed ETF portfolios—defined as investment strategies with at least 50% of assets in ETFs. These products—a type of fund of funds—are linked to more than $100 billion in assets. That’s a small fraction of assets in ETFs overall, which totaled $1.8 trillion as of September 2017, according to the Investment Company Institute. This niche is tiny in the grand scheme of managed assets, but it’s expanding rapidly. The number of ETF managed portfolios in Morningstar’s database at 2017’s midpoint jumped 18% and assets increased 27% versus the year-earlier figure. The business is “growing at a solid clip,” says Ben Johnson, director of global ETF research at Morningstar. There’s also a solid upside trend in the data since 2011, according to Morningstar. The number of firms plying these waters has nearly doubled over the last six years and assets linked to the strategies have surged by roughly 300%. The industry is actually larger than the Morningstar numbers suggest because reps at the big Wall Street wirehouses (Merrill Lynch, Morgan Stanley, and others) also use managed ETF portfolios for clients—portfolios that aren’t tracked in the Morningstar database. There are two main types of ETF managed portfolios. One is offered by ETF providers, including the largest companies in the field—Vanguard, Blackrock, and State Street. The asset allocation programs run by these firms use their respective ETFs and there’s generally no charge beyond the expense ratios of the underlying funds. The strategies in this corner tend to be strategic-oriented with periodic rebalancing schedules. The basic goal is offering broad diversified portfolios for a range of risk tolerances. Piggybacking on the recommended portfolios is free because the fund companies generate revenue through sales of the underlying ETFs. Alternatively, various ETF specialists run managed portfolios using a variety of products, for a fee, usually ranging from 30 to 50 basis points over and above the expense ratios of the ETFs. These are more expensive choices, but the menu runs the gamut, including various tactical asset allocation strategies. For a recent list of strategies available (excluding programs run by wirehouses), see Morningstar’s second-quarter update. Most providers of ETF-managed portfolios have been reporting brisk demand for the products in recent years. Vanguard, for instance, tells Horsesmouth that the division’s assets under management have surged this year, rising to $11.3 billion, a near doubling from $6.8 billion at the end of 2016. That’s still a tiny slice of the company’s $4.7 trillion under management overall, but the ETF-managed portfolios space is expanding rapidly. The medium of choice for tapping into these portfolios is a fund platform offered by TD Ameritrade, Envestnet, Pershing, and several other financial-services intermediaries. Thanks to evolving technology, buying and selling of strategies is now done in a single transaction—the equivalent of buying one ETF. The combination of professional offerings at low or even no cost, along with a “one-click” ability to move money in and out of these portfolios, has created a tailwind for the niche in recent years. John McCombe of Richard Bernstein Advisors (RBA) is upbeat on the future, for his firm and the industry generally. He says that his company is currently running six ETF managed portfolios for advisors with portfolios representing $3.2 billion in assets at October’s close—a year-to-date rise of 120%. As the breadth and depth of individual ETFs has expanded over the years, so too have the asset-allocation possibilities. Advisors may have had a compelling reason to build and manage ETF-based portfolios from scratch in the past. But the menu of ETF-based solutions has exploded over the last five years. As a result, advisors are more likely to find strategies run by outside firms that match their clients’ needs. Jared Wickes, managing partner at Kennedy Wealth Group, says “I’ve tried to straddle the line between asset manager and money gathering.” But the firm decided to take a step back from money management and use ETF-based portfolios managed by third parties, including Provident Capital Management, a boutique shop in Carmel, Ind. that runs several quantitative-driven strategies. Provident’s Drew Wieder says that “more and more advisors realize that their strong point is asset gathering.” He adds that even if an advisor has the talent for overseeing portfolios directly, the operational challenges of risk monitoring and building the trading infrastructure to manage money can be problematic, particularly for smaller firms. freeing up a significant amount of time and resources for other tasks. The increasing complexity of some ETFs, along with the sheer number of choices—more than 2,000 in the U.S.—is another factor that’s raising the appetite for managed portfolios. As fund companies roll out evermore sophisticated fund strategies—many marketed under the so-called smart beta label—the necessary research hurdle rises to understand what’s going on under the hood. Not surprisingly, the enthusiasm for diving into the details tends to fade as the analytical workload increases. Leaving the details to an ETF specialist, in turn, has greater appeal. Adding to the allure of ETF portfolio solutions is the Department of Labor’s (DoL) Conflict of Interest Rule, which redefined the fiduciary standard for financial advisors. Although full implementation has been delayed, there’s a growing awareness in the advisory industry that the regulatory tide is moving in favor of a fiduciary-based business model. In turn, the DoL ruling strengthens the case for using passively managed ETFs, which offer low fees and high transparency —features that align with the fiduciary standards. Another feature that advisors find attractive in ETF managed portfolios: the ability to access professional grade risk management services at a low or even zero cost over the underlying funds. RBA’s McCombe reports that switching to these products “checks a lot of boxes” for satisfying the DoL rules while providing clients with professional-grade portfolio strategies. It’s only natural, he says, that the general move toward a fee-based advisory model in recent years is convincing investment advisors—in wirehouses and those aligned with independent broker/dealers—to adopt ETF-based strategies. Keep in mind that an ETF managed portfolio is a product, and usually an actively managed one. As such, all the standard provisos apply when wading into this corner of investing. The fee for tapping into a managed ETF portfolio varies, with an industry average of roughly 30 basis points, says RBA’s McCombe. But in some cases the fee is zero. Vanguard, for instance, doesn’t charge beyond the underlying expense ratio for its funds. For companies that don’t have their own ETFs, however, there’s a price tag to consider. Paying more for a strategy may be worthwhile, but at some point the odds may work against you if the fee is lofty. In addition, don’t overlook the fact that when you select a managed ETF portfolio for a client you’re essentially choosing an actively managed product. That’s a reminder that you should understand how the strategy operates. Getting up to speed may be as easy as reviewing the literature for a product if it follows a simple rebalancing strategy. For more complex strategies, however, it may be prudent to review the track record and talk with the management firm. For all the allure of managed ETF portfolios, the use of these products still leaves you with a fiduciary responsibility of responsibly selecting one or more investment strategies that align with a client’s risk tolerance and investment objective. Some aspects of financial advisory can’t be transferred. If you’re thinking of making the transition, prepare for some bumps along the way in your relationship with clients. A cynic might argue that you’re imprudently transferring the management of client assets to an outside advisor. Be prepared to respond to that criticism in a thoughtful manner, perhaps by emphasizing that you’re still overseeing the portfolios by selecting strategies and asset allocation plans. The rationale for such a switch, you might add, is that the potential for generating superior risk-adjusted performance is enhanced for clients. The fact that your day-to-day money management tasks will be easier only sweetens the deal. © 2018 Horsesmouth, LLC. All Rights Reserved. To view our performance and disclaimers please click on the strategy below. PCM’s Developed and Emerging Market composites continued to be our top performing strategies through the end of the Third quarter, 2017. They have respectfully held the number 1 and 2 positions since the beginning of the year. Of interest, PCM’s Liquid REIT composite has moved into our top five, now our third best performing published composite YTD. PCM’s Liquid REIT provides investors an ability to participate in publically traded liquid real estate, via our ETF investment strategies. Each month it will rotate into an ETF REIT that our quantitative approach has selected. It is chosen out of a basket of 10 REIT ETF’s representing various sectors of real estate such as office space, strip malls, mortgage REITS, in the US and or International real estate markets. Last quarter we introduced our PCM Strategy Dial. We illustrated PCM’s US Industries composite, in order to demonstrate how the strategy could go from the opportunistic long quadrant to the opportunistic inverse quadrant. This quarter I would like to use our PCM Strategy Dial to illustrate our PCM Absolute Bond Composite. The US and many world sovereign bond markets have been in a long term, 30 plus year, bull market. The PCM Absolute Bond composite has a 6 year GIP compliant track record, during which time there has not been many opportunities to demonstrate how well the inverse ETF may potentially protect and enhance the return of the portfolio. entire year of 2016. 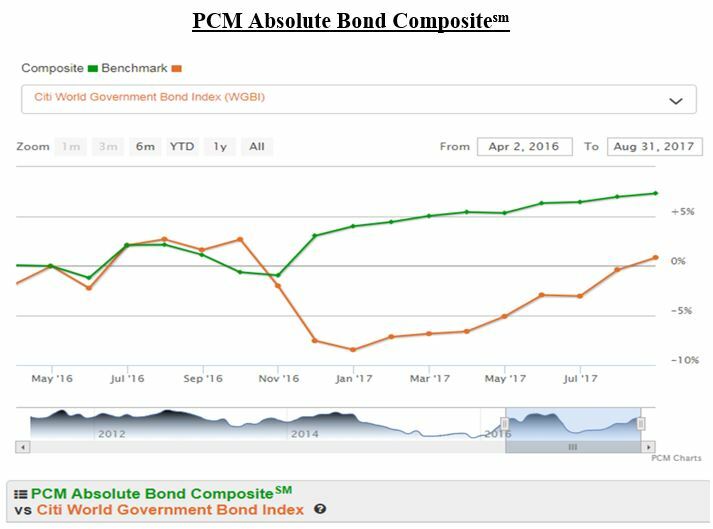 The PCM Absolute Bond strategy moved to “Opportunistic Inverse” in November and December of 2016 resulting in a positive 5% return in our composite for the fourth quarter, versus an 8.5% decline in the Citi Corp Bond (Our benchmark). See chart below showing the monthly performance during the last quarter of 2016. Of course, past performance is no guarantee of future results. However, we believe that the performance of our Absolute Bond strategy during this period, illustrates the potential that our strategies can provide investors. Moving into the final quarter of 2017, our equity composites moved to “Opportunistic Long” in both the US and International space. Specifically, US Industries has moved into 25% each Materials, Industrials, Food and Beverage and Biotechnology. PCM’s Absolute International is 25% each in Canada, Japan, Switzerland and the United Kingdom. PCM’s Absolute Bond is “Spread Long” with 50% in cash equivalents and 50% High Yield Corporate Bonds. Each of the above composites may be reallocated monthly with the exception of PCM’s Absolute Bond,which may reallocate bi-monthly. Valuations remain extreme. There has never been a better time to add a PCM Multi-directional strategy to your portfolio. Please consider PCM’s multi-directional strategies for your clients that are concerned about extreme valuations. Our clients have found that by employing our proprietary risk management system they can truly take advantage of investing strategies with peace of mindsm. Superior full-market cycle returns are directly correlated to a reduction or elimination of large drawdowns in any given portfolio or investment strategy. To accomplish this an investment strategy must employ some form of risk management and should have the ability to capture positive returns in both rising and falling markets. Furthermore, it is important to have the ability to participate in all asset classes, all asset sizes and all asset styles across all markets to insure diversification that is truly non-correlated. Provident Capital Management, Inc. (PCM) is registered as an investment adviser with the State of Indiana, Securities Division. Registration does not constitute an endorsement of the firm by the State of Indiana nor does it indicate that the Adviser has attained a particular level of skill or ability. PCM claims compliance with the Global Investment Performance Standards (GIPS®). To receive a complete list and description of the firm's composites and/or a presentation that adheres to the GIPS® standards, please contact the firm at the address listed. With almost 60% of the S&P 500 companies having reported 1st quarter performance thus far, corporate earnings are expected to rise over 10% from the prior year. This positive performance pushed equities higher in April as optimism for accommodative trade policies, lower corporate taxes and reduced regulation, championed by the Trump administration, began to fade. The breadth of this rally continues to narrow, as an example, 40 stocks are responsible for the majority of the S&P 500 gains and even fewer tech stocks lead the NASDAQ advance; FANG – Facebook, Amazon, Netflix and Google. Narrowing breadth can often be attributed as a symptom of late stage bull markets. We have observed that PCM’s Models have already been reflecting the “late stage” theme as our US Sector and US Industries have moved into traditionally more defensive allocations such as technology, healthcare and utilities. Another theme that has produced positive returns is the move to international developed and emerging markets. U.S. markets, by many valuation methods, are overvalued and approaching the “dot com” era levels. We have observed increased rotation into the less expensive international and emerging markets. During the first four months of 2017, our global strategies have been heavily invested in Europe and the emerging markets, producing positive returns by being positioned to benefit from these flows of funds. We are now seeing our global models become more defensive, reducing allocations to equities in these markets by allocating to gold and bonds. PCM believes that the fourth quarter of 2016 is the potential beginning of a long term bear market in bonds, as interest rates revert back to their long term mean. PCM’s strategies reacted well by opportunistically moving into the “inverse” bond ETF’s. This resulted in earning PCM strategies award winning performance and recognition. PCM's Absolute Bond and PCM US Bond Total Return: https://www.pcminvestment.com/pcm-absolute-bond and https://www.pcminvestment.com/pcm-us-bond-total-return- one star ranking. Top performing ETF bond strategy in their ETF data base for the fourth quarter of 2016. PCM's Absolute Bond: - two star award for top five performing ETF bond strategy for the entire year (2016), third out of 206 products. PCM's Alpha One: https://www.pcminvestment.com/pcm-alpha-one-total-return, and GMAC 3 https://www.pcminvestment.com/pcm-global-macro-3-total-return also ranked number one and two for the quarter in the Global / International Balanced Universe of 329 products. By:Collaborative insight provided by CIO Michael Chapman. Welcome to PCM's quarterly "Quant Coalescence" communication. We suspect that many of you are no different than us. That is to say that when our quantitative models rebalance every 2 weeks for some indexes or once a month for other indexes, you sometimes find yourselves asking "What is behind a rotation into that ETF?" This communication is our opportunity to "unite for a common end" with our clients and partners; keeping you updated on our thoughts and perspectives. As you know, our indexes are based on an absolute approach: we strive to make money in up markets or down markets, while trying to greatly minimize loss in any market environment. Our indexes are also quantitative, reflective of our systematic, unbiased and technical approach. Since our indexes are unbiased, the quantitative models would obviously at times rotate into positions that cause us to scratch our heads. Nevertheless, being so close to the analysis as it unfolds, allows us to quickly begin to validate the fundamental reasons behind the quantitative "following of the money." At other times, the trades are not validated right away; the story unfolds as the days pass. We have been very excited about many of these "validations" and "ah ha" moments. We had another "ah ha" moment when we decided that these insights would also be interesting to those who have entrusted us with their financial peace of mind. Our goal is to be short and to the point, specific to what is happening in our indexes rather than a lengthy macroeconomic perspective. Many of PCM’s composites respectfully tracked the above indices (ETF’s) and in some cases surpassed their respective benchmarks. All of our 22 composites are constructed with an element of “risk management”. Our Absolute Total Return strategies are unique; since our composites can tactically rotate into an “inverse” ETF position, which could produce positive returns while the underlying asset class is declining. PCM’s goal is to provide clients with transparent tactical strategies, which are designed to significantly outperform their benchmarks through a full, low to low market cycle, as opposed to beating them in rising markets only. Given the fact that we have been in a generally rising market since March of 2009, it is not surprising that the strategy has resulted in a high percentage of the time being “Opportunistic Long” or “Spread Long”. When we review our strategy during the last serious bear market of October 2007 through March of 2009, the strategy first moved into a “Spread Inverse” position in the month of December 2007 and, with only two exceptions, remained “Opportunistic Inverse” or “Spread Inverse” through the end of the bear market in March of 2009. While allocations in our PCM US Industries ETF strategy tend to be trend following, it has historically reacted quickly to a change in trend direction. During the October 2007 to March 2009 bear market it moved to a “Spread Inverse” allocation on December 01, 2007 and then back to a “Spread Long” allocation on March 01, 2009. We have received various requests to provide a visual tool that may help further explain how our multi-directional strategies work. We believe the “PCM Strategy Dial” will be a helpful tool when discussing our strategies with your clients and prospects. 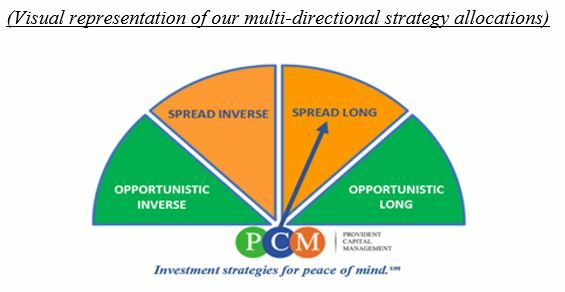 Our “PCM Strategy Dial” will help illustrate in which of the four directional strategy positions our strategies are invested. Additionally, our PCM Strategy Dial will also be available on our website at www.pcminvestment.com. Going into July, our composites moved to “Spread Long” in both the US and International space. Specifically, US Industries has moved to 50% cash equivalent and 25% each Healthcare and Medical Devices. PCM’s Absolute International is 25% each in cash equivalent, international treasuries, New Zealand, and Singapore. PCM’s Absolute Bond is “Spread Long” with 50% in cash equivalents and 50% international corporate bonds. Each of the above composites may be reallocated monthly with the exception of PCM’s Absolute Bond, which may reallocate bi-monthly. In our May QC letter, the International developed and emerging markets outperformed the US markets in the first quarter of 2017. .In our May QC letter, the International developed and emerging markets outperformed the US markets in the first quarter of 2017. The above statistics have not been lost on investors as they continue to move to emerging markets in order to find more reasonably priced valuations. Please consider PCM’s multi-directional strategies for your clients that are concerned about the above valuations. Our clients have found that by employing our proprietary risk management system they can truly take advantage of investing strategies with peace of mind. The markets continue to push higher, as the “Trump Trade” and “Trumponomics” take hold. The question remains; which is it? Are equities still overvalued? Or have the dynamics of a Trump administration completely changed forward growth expectations to a point that stocks are now a good bet? What we do know for now is that the markets continue to be overvalued to a level comparable to the markets right before the 1987 and 2000 selloffs. At the same time, the markets really like the idea of less regulation, lower corporate taxes, repealing Obamacare and expectations of big infrastructure and military spending. Bonds have sold off as the anticipation that the Federal Reserve will begin raising interest rates at the fast approaching December meeting. Gold has followed suit in that selloff, as the dollar has strengthened. The anticipated rising interest rates have also quelled fears of inflation adding to gold’s fall from grace. Gold’s weakness may be short term, but for now gold is down over 10% since the election. Don’t be fooled into thinking that this is a broad based rally, though. According to Chief Economist David Rosenberg, Financials and Energy have been responsible for most of the rise in equities. He goes on to say, “Both have lived up to their billing, having advanced 14.1 percent and 7.0 percent, respectively, since the election. These two sectors, representing just over 20 percent of the S&P 500 market cap, have accounted for all the gains since then. The other 80 percent of the stock market is flat as a pancake.” Our holdings show that Industrials, Materials and Transportations are also up 10% or more, based on our monitoring of PCM holdings of XLI, XLB and IYT in our quant models. David Rosenberg continued that “Other than those sectors, the market is actually down. ” In reference to the “Trump rally” Rosenberg points out that “Practically every new president back to Truman seven decades ago enjoys what is otherwise known as a Honeymoon Rally – the median stock-market advance the month after an election is nearly 1 percent. Ronald Reagan…saw the equity market soar 6 per cent in his first month in office. The market (then) peaked less than four weeks into his term and for the next two years we had an economic downturn and a 25 percent slide in the stock market. The combination of rising bond yields, Fed tightening and a stronger dollar took care of that honeymoon.” As of Friday morning, December 9th, the S&P 500 is up over 5% since the election of Trump. So….which is it? (Picture a “shoulder shrug” here.) Once again, this tough question is what strengthens our confidence and resolve in our multi-directional, quantitative (read “non- emotional” here) strategies that analyze all asset classes for inclusion. Our models have benefitted from virtually all of the selloff in bonds by being in the ETF that goes up when bond prices go down. We have also had exposure to materials, industrials, financials, and broad based equity investments with heavy exposure to the same, such as the Russell 2000. We have been in the U.S. dollar, inverse gold and long high yield corporate bonds, which have moved higher with equities despite U.S. Treasuries being down. Emerging market equities and bonds have been down since the election and is one area where our models have now moved to cash after being down in November. PCM also has been awarded another performance award from Informa Investment Solutions, this time for the PCM Managed TIPS composite, which earned the “Top Gun” performance award in the “All Maturity/Variable Universe” bond category for the third quarter of 2016. We anticipate being awarded numerous performance awards for the current quarter, however we won’t know that until well into the first quarter of 2017 after the returns are “on the books”. Please see more specific details about all of our performance awards below. 1. PCM US Bond Total Return Index SM: Inverse U.S. Treasuries, high yield corporates and cash equivalent. 2. PCM Absolute Bond Index SM: Inverse U.S. Treasuries, high yield corporates. 7. PCM Total Return Portfolio IndexSM and PCM Stable Growth Plus+ Portfolio IndexSM: Inverse U.S. Treasuries, High Yield Corporates, Financials, Industrials and Materials are all themes in these portfolios. 8. PCM Global Tactical IndexSM: Materials, Industrials, Inverse Gold, and Dividend Paying Equities. And now…our award ceremony….PCM was again been recognized as a "Top Gun" for our performance. This time for the 2nd quarter of 2016 by Informa Investment Solutions. The PCM Absolute Commodity model ranked #1 out of over 200 other products and money managers in the "ETF Global Balanced Universe" category and also #1 in the "Overall Global/International Balanced Universe"
In addition to the above mentioned “Top Gun” performance awards from Informa Investment Solutions, PCM composites have been previously recognized for performance by Informa Investment Solutions; the PCM Absolute Bond Compositesm for the three year performance ending the 4th quarter of 2014, as well as previous awards for 1-year trailing performance and 3-year trailing performance. As of 2nd quarter 2014, the PCM Absolute Bond Compositesm and the PCM Absolute Commodities Compositesm both won a "Top Gun" award for performance in their respective category for the 1-year trailing performance period, with the PCM Absolute Bond Compositesm also winning the "Top Gun" award for 3-year trailing performance. The PCM Alpha 1 Compositesm was awarded the "Top Gun" performance award for the 1st quarter of 2014. We are very pleased to see these particular multi directional strategies being recognized, as the PCM Absolute Bond Strategysm and PCM Alpha 1 Strategysm are particularly timely for where we are in the current market cycle.